Selected for their individual and unique attributes, these 4 varieties will make a great addition to your garden this year. Each has unusual talking points. Packed with flower and easy to care for like all fuchsias, but colour combinations or flower types that are quite different. If you are a real fuchsia enthusiast, they will also make perfect additions to your collection Checkerboard A perfect blend of red and white long tubular blooms when in full flower a very strong upright variety that is perfect for growing as a Standard or lollipop shape. As a bush it will grow to around 1m (3ft) tall. Hawkshead A graceful, bushy plant with masses of dainty light pink-lavender blooms. It is also fabulous because despite the light colour, it is winter hardy! As a bush it will grow to around 60cm (2ft) tall. Eruption This flowers are unlike virtually any other variety we have seen, both in terms of the massive volume of coral-red flowers as well as the colourful impact. It has a trailing habit so is perfect for containers. Blacky So named because in comparative trials it was found to have the darkest coloured deep purple, almost black,Corolla or underskirt! A truly magnificent and deservedly popular choice – ideal for planting wherever it can trail! 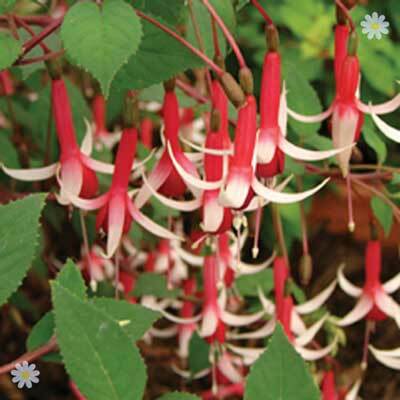 Be the talk of your street with these unusual and rewarding fuchsias.